There’s no denying the multitude of dining options here in Singapore. Whether you’re hankering for Japanese, French or even Italian food, there’s always bound to be a restaurant well-suited to satisfy your palate. Don’t even get us started on the plethora of dessert, brunch and afternoon tea venues — the possibilities are endless. But sometimes, one can’t help but crave for something a little more elaborate — where the meal feels more like a curated experience replete with innovative dishes and the best seasonal ingredients. Stepping in with a solution is OCBC, which has its Gastronomic Adventures dining programme that sees some of Singapore’s finest restaurants presenting special menus exclusive to OCBC’s credit and debit cardmembers. These establishments serve up everything from Japanese to Spanish cuisine, and share one similarity: Each of their menus features one highlight dish that’s not available on their usual repertoires. OCBC VOYAGE cardholders are in for an additional treat, as some of the restaurants offer additional perks such as complimentary glasses of champagne, or sake pairing at special prices. As for OCBC 365 cardmembers, they can look forward to receiving 3% and 6% cashback on dining for weekdays and weekends respectively. If you’re not yet a member, simply apply via Lifestyle Asia Singapore and spend S$300 in the first month of your card approval to receive a S$50 cashback. The list of participating restaurants in OCBC’s Gastronomic Adventures is set to change every few months, so you can always expect to try something new and exciting. All you need to do is make a reservation at the restaurant, and to quote “OCBC set menu” upon doing so. Read on to find out more about the sumptuous feasts that await you. A tranquil spot dressed in calming wood and earth tones, Béni at Mandarin Gallery serves up French cuisine with a Japanese twist. 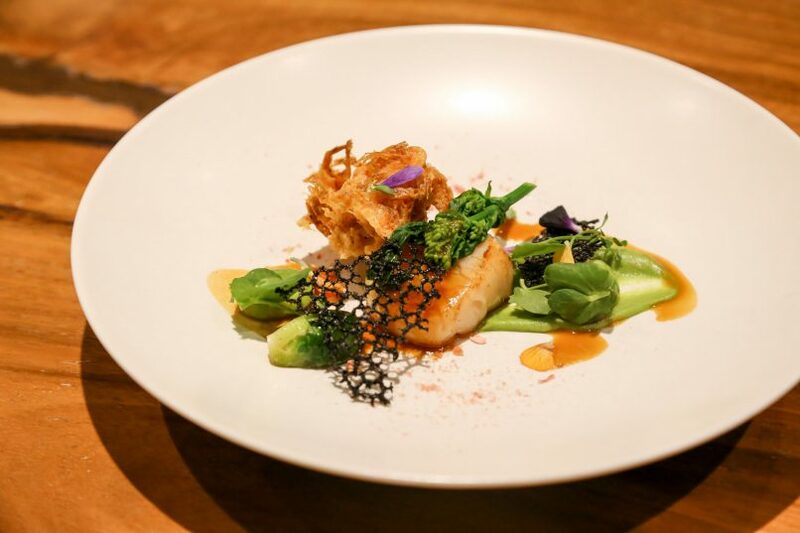 The one-Michelin-starred restaurant has introduced a six-course lunch menu priced at S$108++ and an eight-course dinner menu at S$238++. The lunch set showcases tantalising highlights such as tempura-battered bamboo shoots draped with silky jamón and sprinkled with shaved Comté cheese and black pepper. We’re also very much enamoured with the sweet white asparagus (imported from Loire Valley in France) that’s contrasted with chewy conch shell and bitter-sour orange pulp, and executive chef Kenji Yamanaka’s intriguing mushroom concoction comprising a layer of black truffle, shimeji, shiitake and enoki mushrooms set atop a cold, fluffy chawanmushi base. A definite must-try is the scallop dish that’s available only on the OCBC menu. 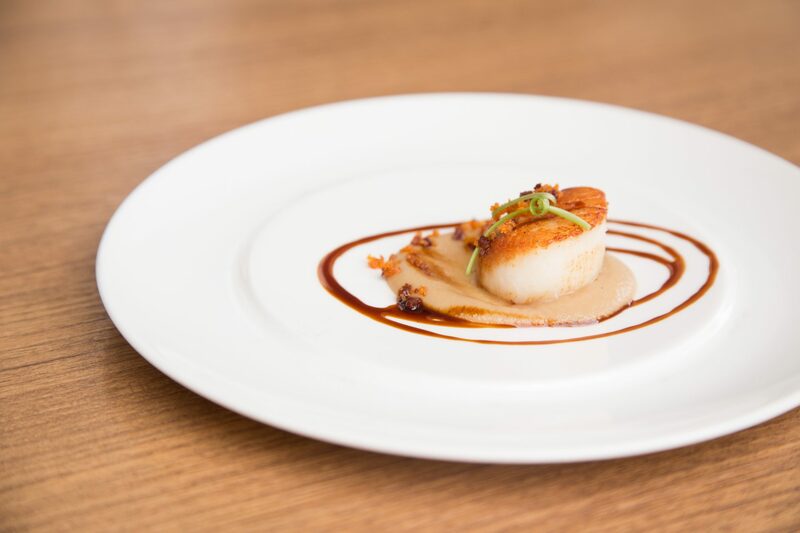 The plump, juicy scallop is pan-seared till its edges are delightfully browned and slightly crisp, before being paired with fried sakura ebi and a sweet green pea purée. Dehydrated sakura flowers and salt are scattered on the plate, providing delicate bursts of saltiness and umami. The menu is available until 20 June 2018. VOYAGE cardmembers will receive a complimentary glass of champagne. This buzzy, convivial spot in Chinatown is helmed by Barcelona-born chef Carlos Montobbio and focuses on contemporary cuisine with Spanish and Catalan flavours. Grab a seat at its open kitchen counter, where you can catch the chefs in action as they whip up tasty fare such as tangy Tsarskaya oysters topped with pickled ginger flower and ponzu sauce, scallop with chorizo crumbs and an earthy burnt onion sauce, and succulent grilled octopus sprinkled with roasted corn kernels and drizzled with chorizo oil. These scrumptious offerings are just a few of the highlights on the restaurant’s nine-course menu, which is priced at S$108++ and is available for both lunch and dinner. Among our favourites are the melt-in-the-mouth pork jowl, which is layered with crispy skin and speckled with togarashi for a hint of spice, and the crunchy sucrine lettuce — Josper-grilled till it’s slightly charred for a smokey flavour, and accompanied by a herb yoghurt sauce punctuated with macadamia nuts. Another standout is the Fricandó, a hearty, comforting and decadent beef stew that’s exclusive to OCBC cardmembers. 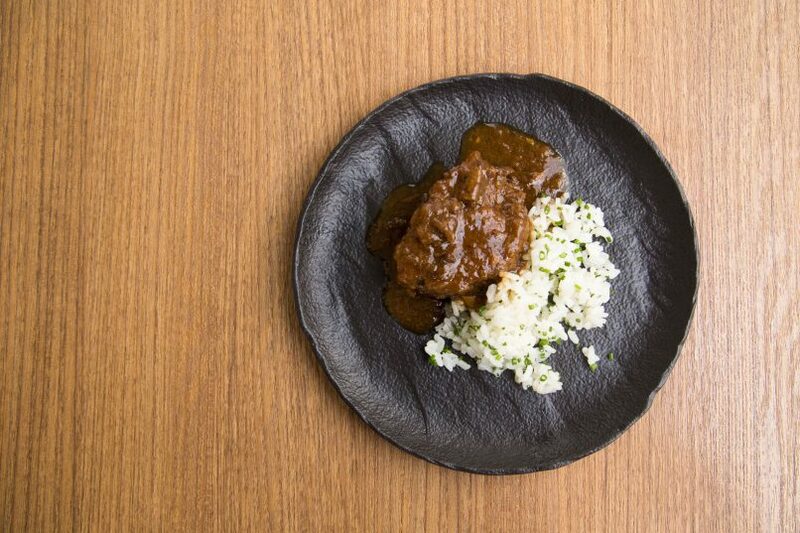 Inspired by a childhood dish that Montobbio grew up eating at home, it comprises tasty wagyu cheek that’s braised till fork-tender and served with Barcelona-imported moixernons (a type of dried mushroom) and bomba rice. The menu is available until 20 June 2018. VOYAGE cardmembers have the option of rounding off their meal with chef Carlos’ favourite wine of Gramona Argent Blanc de Blancs Gran Reserva 2011 at S$158++ (U.P. S$198). Singapore isn’t short of excellent sushi restaurants, but one quality that makes Sushi Kimura particularly noteworthy is its chef-owner Tomoo Kimura’s meticulous attention to detail. The restaurant’s sushi counter, for instance, is made from 150-year-old Hinoki wood, while its placemats are embellished with hand-carved stamps of Japanese characters to reflect the current season. This fastidiousness extends to the food as well. Many of the dishes on Sushi Kimura’s eight-course lunch omakase menu (S$250++) arrive beautifully presented on exquisite tableware. A combination of seasonal sashimi, for example, is set atop a hexagonal plate adorned with tree motifs and Japanese words. The fish tastes divine, too: There are smokey slices of binchotan-seared bonito, bouncy and chewy ark shell, silky smooth pieces of yellowtail, and sweet Hokkaido botan ebi. Other tempting dishes on OCBC’s Gastronomic Adventures menu feature a Hokkaido hairy crab chawanmushi, which is served in a hollowed-out crab shell and crowned with a generous portion of crab meat and roe, and the restaurant’s signature rice bowl overflowing with uni, chopped toro, ikura pearls and onsen egg. 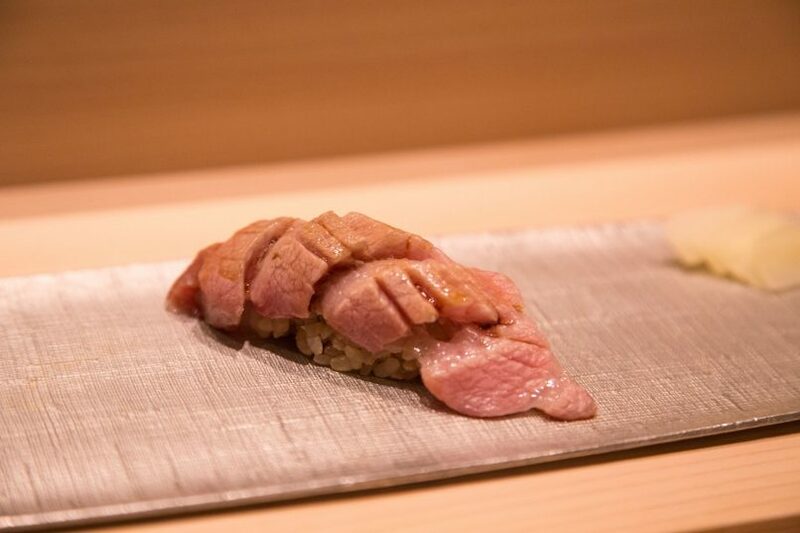 Another delectable highlight is the Brown Rice Sushi Degustation, an OCBC-exclusive of akami (tuna top loin) and otoro (fatty tuna belly) sushi with brown rice. The akami yields a firm, lean bite and is marinated in soy sauce, while the otoro is an indulgent, fatty treat that’s seared under burning binchotan embers to imbue it with a subtle smokiness. Sushi Kimura also offers a dinner omakase menu at S$400++. Both the lunch and dinner menus are available until 20 July 2018. VOYAGE cardmembers have the option of pairing their meal with four glasses of sake for S$70 per person. Furnished in black and grey hues, with white hexagonal tiles as a backdrop to its open kitchen, and a map of Alsace carved out on one of its walls, Lerouy is one sleek and sophisticated restaurant. A long wooden table meanders through its space, while bright spotlights from above illuminate every dish that’s presented to diners. Opened last December, the restaurant is headed by owner-chef Christophe Lerouy — who previously helmed the kitchen at one-Michelin-starred Alma — and specialises in modern French cuisine inflected with Asian flavours. As part of OCBC’s Gastronomic Adventures, Lerouy has put together a six-course dinner menu at S$108++. The food is prepared carte blanche, where the menu is dependent on the availability of seasonal ingredients, and what the chef decides to serve that night. Examples of dishes that may appear on the menu include beef tartare embellished with a miso butter ice cream and blobs of sweet black garlic and salty miso purée, and French pigeon wrapped in almond and yoghurt, and complemented with a syrupy black cherry and liquorice sauce. A definite crowd-pleaser is the gorgeously soft salt-baked cabbage, which is swathed with a sliver of lardo and an umami-rich anchoïade sauce (an anchovy-based Provençal dip). Who knew vegetables could taste so sinfully delicious? Another worthy contender is Lerouy’s white asparagus with uni — which is exclusive to the OCBC menu and the only permanent dish on it. 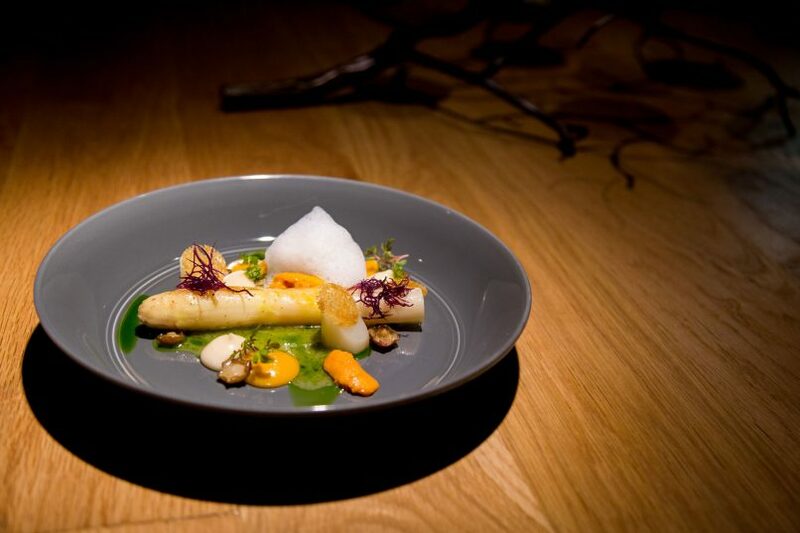 It comprises a fat, tender stalk of white asparagus surrounded by smaller pieces of asparagus, buttery tongues of uni, and dollops of briny uni cream. This extravagant medley of ingredients sits in a lightly flavoured sauce made from dashi and uni. The menu is available until 20 July 2018. Voyage cardmembers can pair their meal with six glasses of champagne at S$118 (U.P. S$140).